ORR Protection Systems will be hosting its annual seminar series, A Morning with the Experts, beginning in March and running through the end of May. The series travels from east to west, reaching cities throughout the U.S. and brings with it knowledgeable Fire Protection System experts presenting industry leading training and information. Click a City to Register! Registration can be done online, by emailing seminars@orrprotection.com, or by calling 800.347.9677 ext. 4523. We look forward to seeing you there! The theme for this year's series, Become a Fire Protection Champion, will encourage companies to adopt fire safety advocates within their organization in order to provide awareness, monitor fire safety systems, and ensure the business will be protected in the event of a fire. The seminar is designed to first help businesses understand the essential elements of their Fire Life Safety Systems, any NFPA code changes they need to be aware of, and the requirements for inspection, testing and maintenance to keep facilities in compliance. The series is also designed with architects and engineers in mind, and will be discussing system design tips for lowering maintenance cost and improving serviceability. ORR Protection has hosted its seminar series since 2003 in an effort to bring people from multiple backgrounds (fire service, facility management, architects, engineers, and contractors) together in one spot to learn more about the fire protection industry. 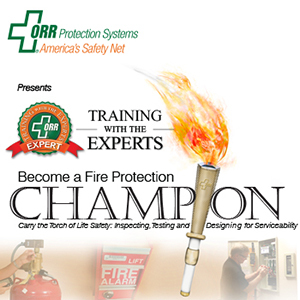 Participants can earn continuing education credits for attending the seminar, and will have multiple opportunities for one-on-one conversations with ORR's fire protection experts. Business moves at such a fast pace today, every company should have a Fire Protection Champion. 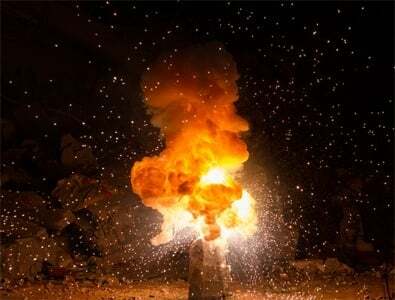 The cost associated with downtime or loss of productivity due to false alarms or even worse the loss of assets due to a fire is simply unacceptable. If you want to be or need to be that Champion, this is a seminar you won’t want to miss. We’re inviting everyone responsible for fire protection, at all levels of your organization, to attend. What you will learn from the Experts? This seminar is designed to first help you understand the essential elements of your Life Safety Fire Systems, the current NFPA code changes you need to know, and the requirements for Inspection, Testing & Maintenance to keep your facilities in compliance. For architects and engineers, we will also discuss system design tips for lowering maintenance cost and improving serviceability. Learn the key elements for Inspection Testing and Maintenance of Sprinkler, Fire Alarm & Suppression Systems. Learn how to react properly to a fire panel alarm, supervisory and trouble signals. Whether you are an Engineer, Facility Manager, Contractor or a Fire Marshal, if you want to stay on the cutting edge of new products in the marketplace and understand where the fire industry is trending. You will learn about new technologies in air sampling smoke detection, along with emerging trends in touch screen fire panels.